Wet to moist. Undisturbed, moderately moist prairies, wet prairies, sedge meadows, calcareous fens, and rarely dry hill (goat) prairies. Full sun. Limy soil. This is a slow growing, long-lived, 4½″ to 13¾″ tall, erect, perennial forb. It rises on many stems from a horizontal underground stem (rhizome) and a mass of densely spaced roots. It often forms dense clumps of up to 50 or more stems. The plants in a clump may be all attached to the same rhizome or to many rhizomes that have become detached from a single parent rhizome. The rhizome branches repeatedly, forming a new branch every 3 to 5 years. The branches are up to about 3″ long. The nodes from which aerial stems emerge are closely spaced, 3 ⁄16″ to⅜″ apart. The roots are white, slender, fleshy, tangled, and up to 11¾″ long. In the first two or three years after germination the plant lives entirely underground as a shapeless mass of cells (protocorm). In the third or fourth spring a single leafy stem rises from the tip of the rhizome. This stem will not produce flowers. It is estimated that the plant does not reach maturity and produce flowers until 12 years after germination. On mature plants the flowers develop early, before the leaves are fully developed or even unfurled. 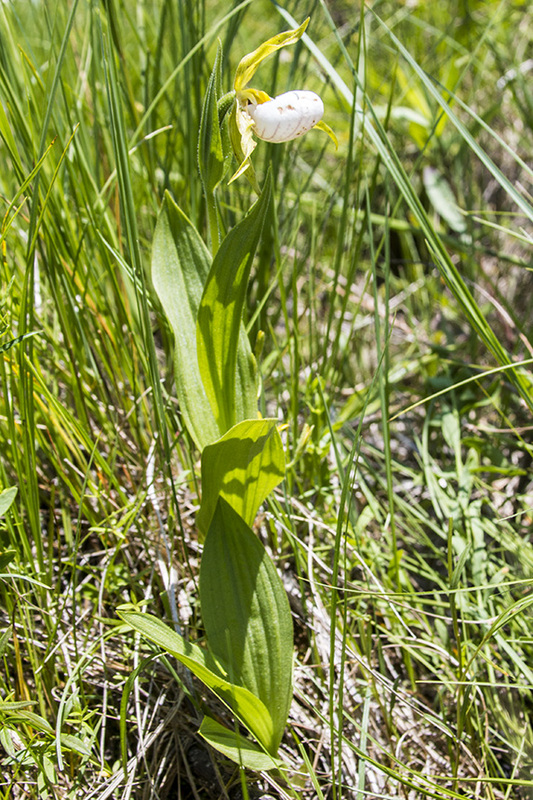 At this stage the flower is small in a cluster of leaves close to the ground. Stem leaves arise from the lower half or two-thirds of the stem. 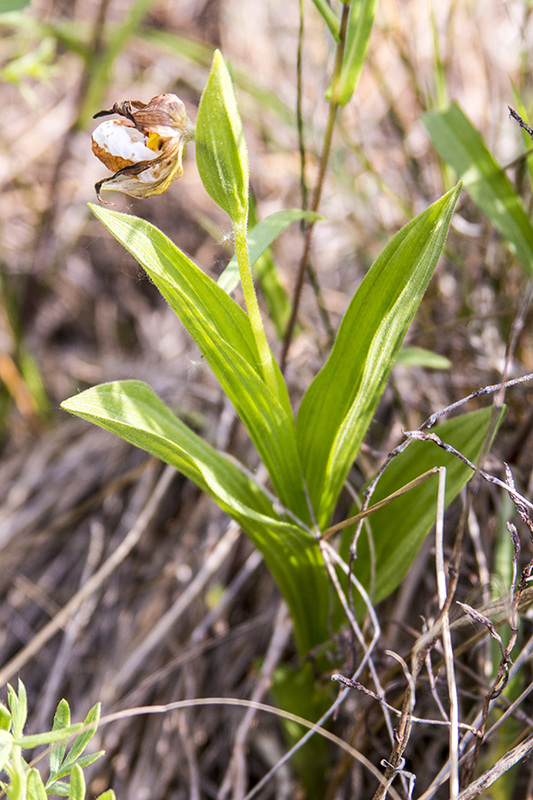 On the lower stem there are 2 to 4 alternate, overlapping, bladeless, scale-like, sheathing leaves. Above that there are 2 to 5, usually 3 or 4, well-developed leaves. Upper stem leaves are alternate and are held nearly erect. They are stalkless, 2″ to 6″ long, ¾″to 2⅜″wide, and often overlap at the base. Each leaf blade is lance-shaped or elliptic to inversely lance-shaped; parallel veined; and plaited or folded, like a fan. It is angled at the tip and sheaths the stem at the base. The upper and lower surfaces are green are sparsely to densely covered with short hairs. The margins are untoothed. The stem is unbranched, sparsely hairy, and 4½″ to 13¾″ long. The inflorescence is a solitary flower rarely two flowers, at the end of the stem. It is closely subtended by a single modified leaf (bract). The bract is leaf-like, green, erect, 1¼″ to 4¼″ long, and ⅜″ to1¼″wide. 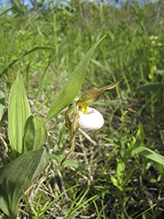 The flower has three sepals and three petals and is upside down due to the twisting of the flower stalk. 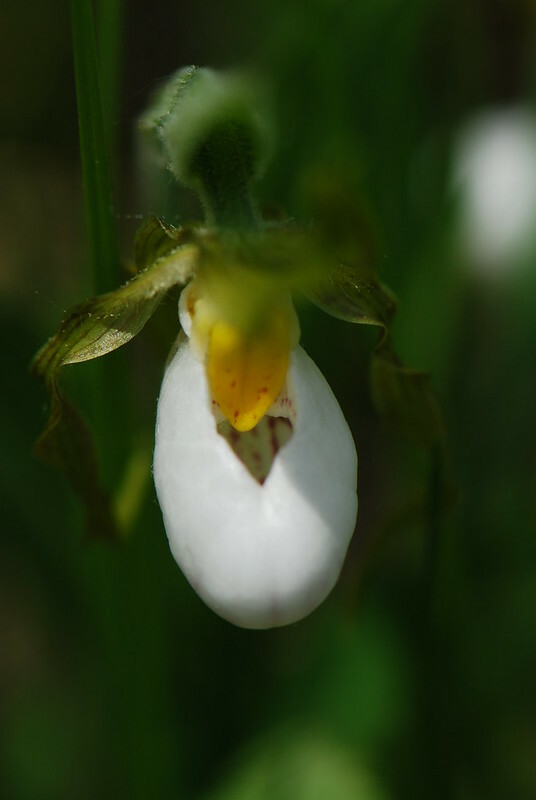 The upper (dorsal) sepal is egg-shaped to egg lance-shaped, ⅝″ to 1⅜″ long, ¼″ to ½″ wide, and is arched over the inflated lower petal (lip). It is sharply angled at the tip, has wavy margins, and may be slightly twisted spirally. It is greenish-yellow and usually spotted or streaked with reddish-brown to reddish-purple. The two lateral sepals are fused together into a single structure (synsepal) that is located directly below the lip petal. The synsepal is egg-shaped to lance-shaped, ½″ to 1⅜″ long, ¼″ to ⅝″ wide, and is similar in appearance to the upper sepal. The two lateral petals are lance-shaped to linear lance-shaped, ⅞″ to 1¾″ long, ⅛″ to 3 ⁄16″wide, and similar in appearance to the sepals. They are spreading to drooping, have wavy margins, and are spirally twisted. They are longer than the lower lip. The lip is inflated to form a large, showy, egg-shaped, ⅝″ to 1″ long pouch. The pouch is white with faint, reddish-purple, blotchy streaks along the veins. The upper (dorsal) surface has a ⅜″ to ⅝″ long longitudinal fissure. As with most Orchidaceae, the filaments and style are united to form a column. There are 2 stamens, one on either side of the column, and an enlarged, egg-shaped staminode at the tip of the column. The staminode is yellow with reddish-purple spots. The fruit is a single, erect, lance-shaped to elliptic, strongly ribbed, ¾″ to 13 ⁄16″ long capsule. 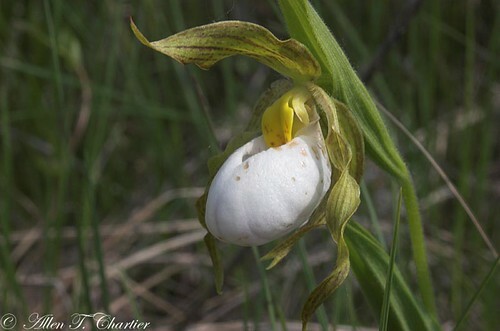 Andrews’ lady’s slipper (Cypripedium x andrewsii) is a hybrid of Cypripedium candidum and Cypripedium parviflorum. 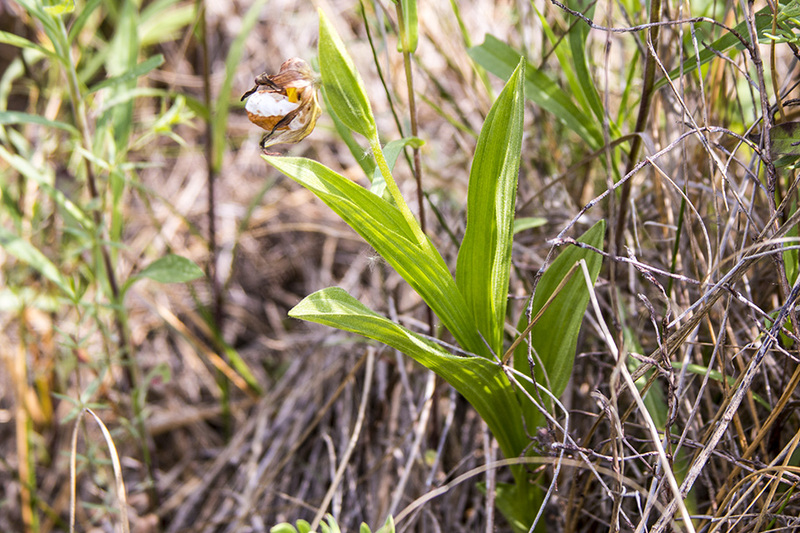 It is rare and has only been recorded in Dakota, Blue Earth, and Becker Counties. 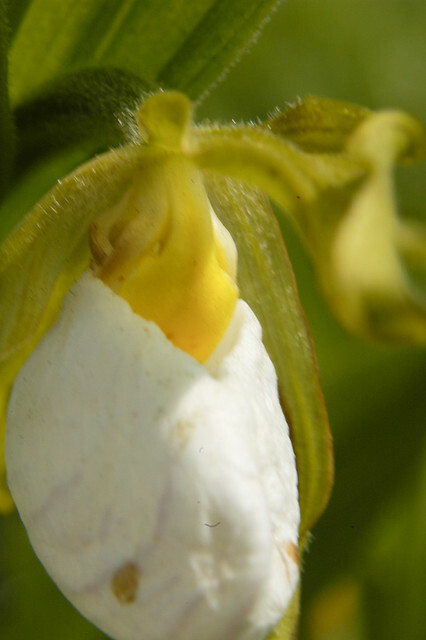 The flowers may be cream-colored, ivory, or yellow, and they may be larger. Sources: 2, 3, 4, 5, 6, 7, 24, 25, 28. 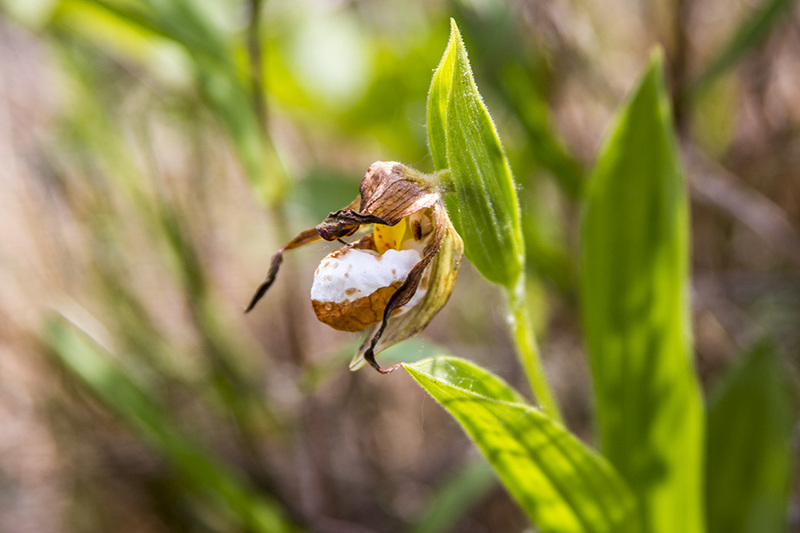 A tuber-like mass of cells on the seed of an orchid that precedes the production of above-ground parts. A floral structure formed by the partial or complete fusion of two or more sepals. This colony of White Lady's Slippers (Cypripedium candidum) grows near St. Peter, Minnesota. This colony is under severe threat by a rapidly advancing reed canary grass invasion, so it is to be hoped that more seeds (from hand pollination, see individual photos) will be available to further colonize a nearby area that is, so far, free of the invader. 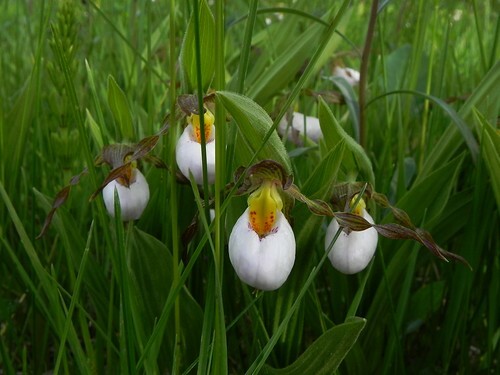 The nearby area had no Cypripedium plants 10-15 years ago, but now has clumps here and there. 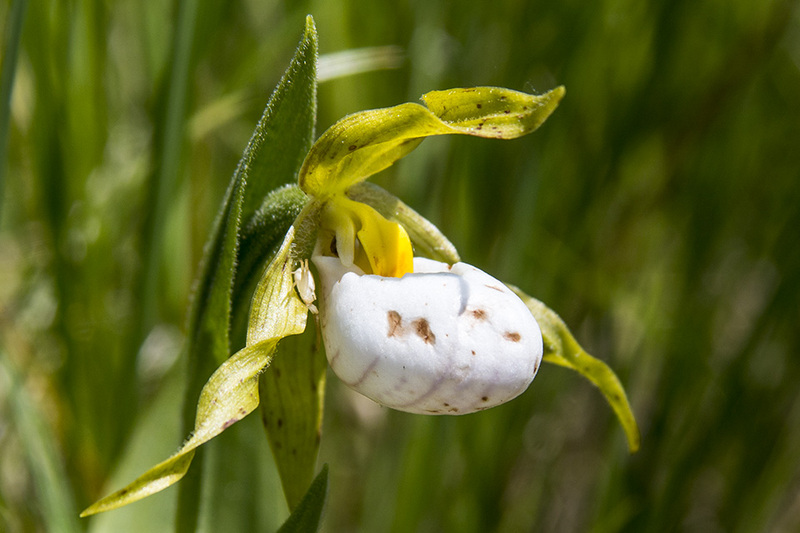 GPS mapping of both the extent of the Cypripedium colony and the advance of the invading grass have been done, and it is hoped that interest can be generated in beating back the invasion. This is a draft video for my Walpole Island Species at Risk project. The music is by Sigur-Ros, "Salka," Footage taken on a small Canon Powershot while on a plant count in May 07. Shoreline monitoring over a three year period, 2007, 2008 and two years later in 2010. The same stretch of shoreline on Squirrel Island was documented. The area is home to critically endangered habitat. This is the same video as the one posted May 13 2010, I tried uploading at a higher resolution.